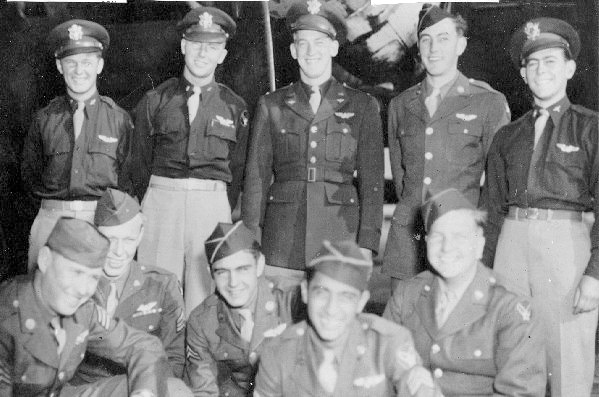 Twenty-One credited Regular Combat Crew missions: 103(A) 3 Feb 1944, 107, 108, 111, 112(A), 113, 114, 115, 116, 117, 118, 120, 121, 123(S), 132, 133,134, 136, 137, 144, 158, 161, 162, 171 (5 June 1944). Nine Credited Lead Crew Combat missions: 159 (24 May 1944),175,178,182, 187, 193, 205, 224, 236 (5 Sept 1944). (A) Non-credited aborted missions - (S) Non-credited mission in a spare B-17 - returned to Molesworth when not needed. 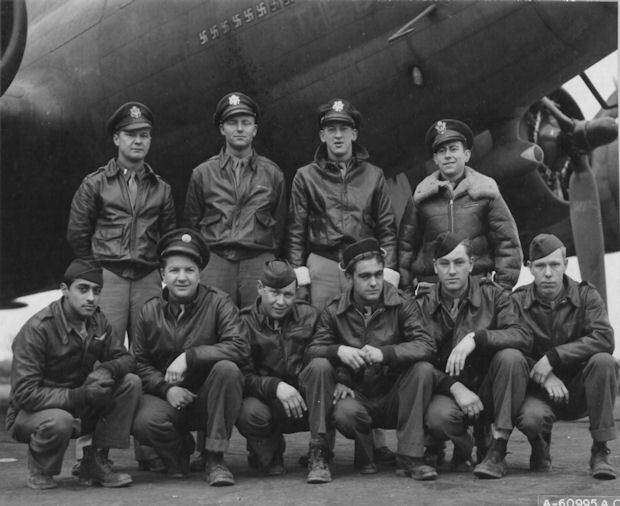 Lead Crew mission 182 flown with a 384th BG(H) Co-Pilot and formation. For Mission dates, targets and Mission Reports, see Combat Missions. Capt Kenneth C. "Buzz" Edwards (P) - Missions 103 & 107 flown as CoPilot with a mission orientation Pilot and crew. Other Regular Combat Crew missions flown as First Pilot. Four Lead Crew missions flown as Pilot (182, 205, 224, 236). Five Lead Crew missions flown as CoPilot with Group or Squadron Commanders as Pilots. Was appointed 359th BS Operations Officer. 30 mission combat tour completed on 5 Sept 1944. 1Lt Edwin V. Peterson (CP) - Flew on 20 credited missions as Capt Edwards Crew CoPilot - 108, 111, 112(A), 113, 114, 115, 116, 117, 118, 120, 122, 123(Spare), 132, 133, 134, 136, 137, 144, 158, 161, 162, 171. Flew on 8 missions with other Pilots - 130, 145, 151, 160, 169, 172, 176, 177. Last mission (185) flown as First Pilot after being upgraded from CoPilot to Pilot. 30 mission combat tour completed on 19 June 1945. 1Lt Coleman Sanders (N) - Flew on 18 credited missions as Capt Edwards Crew Navigator - 108, 111, 112(A), 113, 114, 115, 116, 117,118, 120, 122, 123(S), 132, 133, 134, 136, 137,144, 158, 161. Flew on 12 missions with other Pilots - 121, 124, 125, 126, 129, 130, 141, 142,150, 159. 30 mission combat tour completed on 27 May 1944. Served as 303rd BG Association Photographer at many 303rd BGA Reunions. 2Lt Everett J. Anderson (B) - Flew on 8 credited missions as Capt Edwards Crew Bombardier and was then removed from combat status for an unknown reason - 108, 111, 112(A), 113, 114, 115, 116, 117, 118. Substitute Bombardiers used after mission 118. T/Sgt Kenneth V. Johnson (E) - Flew on all of the Capt Edwards Regular and Lead Crew missions except for 103 & 107. Flew on mission 195 as a Lead Crew Engineer. Completed 30 mission combat tour on 9 Sept 1944. T/Sgt Herbert W. Kennedy (R) - Flew on all of the Capt Edwards Regular and Lead Crew missions except for 103, 107, 182, 205, 224, 236. Flew with other Pilots on missions 183, 186, 194, 195. Completed 30 mission combat tour on 30 June 1944. S/Sgt Abel G. Guzman (BTG) - Flew on all of the Capt Edwards Regular and Lead Crew missions except for missions 103, 107, 113, 122, 182. Flew with other Pilots on missions 126, 186, 195. Completed 30 mission combat tour on 5 Sept 1944. T/Sgt Fay S. Abernathy (WG) - Flew on all of the Capt Edwards Regular and Lead Crew missions except for missions 103, 107, 118, 120, 161, 162, 182, 224. Flew with other Pilots on missions 195, 275, 276. Completed 30 mission combat tour on 23 Nov 1944. S/Sgt Adam Champagne (WG) - Flew on 10 credited missions with the Capt Edwards crew. 108, 111, 112(A), 113, 114, 115, 116, 117, 122, 123(S), 132, 133, 134. Crew flew with only one Waist Gunner on missions 161, 162, 182, 193, 205, 224, 236. Last mission flown on 11 April 1944. S/Sgt Francis S. "Pete" Kowalk (TG) - Flew on all of the Capt Edwards Regular and Lead Crew missions except for missions 103, 107, 159, 182, 187, 193. Missions 159 & 187 flown as Waist Gunner. Flew with other Pilots on missions 176, 212, 218. Completed 30 mission combat tour on 5 Sept 1944. Photographers - Flew with the Capt Edwards crew on six missions: T/Sgt W.H. Green (112, 137); S/Sgt R.G. Hunter (114); S/Sgt G.E. Gamble (162); Sgt J.G. Zaphirion (205); Sgt D.E. Skinner (230).